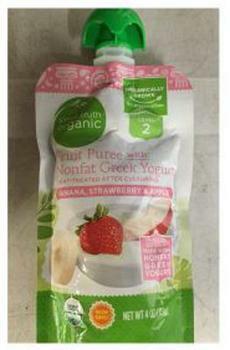 Perrigo Company, in coordination with The Kroger Company, is recalling one production lot of Simple Truth Organic Banana, Strawberry & Apple Fruit Puree with Nonfat Greek Yogurt. The recalled product, (LOT L8159, best by 08/06/2019), was sold exclusively by Kroger stores in Alabama, Arkansas, Georgia, Illinois, Indiana, Kentucky, Louisiana, Michigan, Missouri, Mississippi, Ohio, South Carolina, Tennessee, Texas, Virginia and West Virginia. Customers who purchased the recalled product may dispose of it or return it to any Kroger store for a full refund. Consumers with questions may contact Perrigo at (800) 538-9543 from 8:00 – 5:00 (EST) Monday through Friday.